2.4% of cultivated areas on the earth. and 22 000 dead each year. The excessive use of fertilizer and pesticides has for consequence the land degradation, lower yields, pest resistance to pesticides and a significant reduction in wages of cotton producer. For all these reasons, cotton producer countries are more and more interested in alternative modes of production as the organic and fair cotton production. They are also hundreds of millions of cubic meters of irrigation water that could be used to increase yields of food crops, and finally one of the greatest ecological disasters of the twentieth century : the drying of the Aral sea... In short, choose organic cotton for the benefit of nature and man. The bigger producers are China, the USA , India, followed by Pakistan, Uzbekistan, and Brazil. The FAO estimate that near 100 million of rural families depend directly of cotton production. The organic cotton production adopt the fair trade principles. Cotton plant (Gossypium) belongs to the Malvaceae family, like okra and hibiscus. In the wild state, the cotton is a perennial plant, robust with hairy leaves and short fibers. 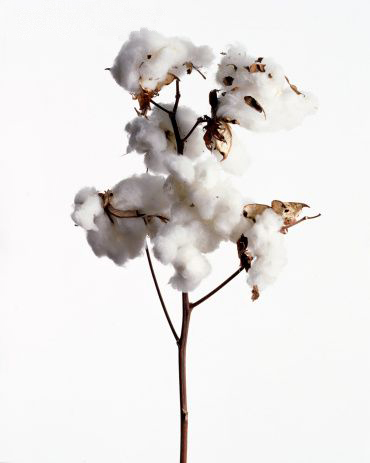 In cultivation, cotton is an annual plant. The cotton plant is grown in areas with dry climate and long growing seasons without frost, with a high temperature (preferably about 30°C), and enough sunshine. A minimum of 500 mm of water per year well distributed in time from germination to the formation of capsules is sufficient for the complete cycle of the cotton plant. Excess of water leads lower performance (loss of capsules) without the plant shows no apparent signs of abnormality. The soils consists of sand, clay, silt and organic material and serve as a reservoir for nutrients and water needed for plant growth. A healthy soil is home to communities living microbes involved in decomposition of plants and dead animals, releasing nutrient to be used by plants. However, heavy soils (deep, clayey, dark colors) are characterized by a high water retention, high fertility and a lower risk of being affected by drought. In this case, the intensive cultivation of high performance variety is possible (for example corn, hibiscus, FK 37 cotton, beans, soy, sorghum, voandzou, sesame). The heavy soils require deep plowing and frequent cultivation operations. Organic agriculture and fair agriculture are ruled by standards recorded in repositories. To sell organic and fair cotton on the international market, every producer, processor and exporter lust comply with standards and regulations established. The compliance of a fair-organic project is checked through annual inspections performed by independent certification agencies The certification aims to obtain certificates stating that the production process complies with standards established by the community. Relative to the organic certification, the most important regulations are those of the European Union (EEC 2092/91), those of the USA (NOP) and those of Japan (JAS). Compared with the fair trade certification, the comparison repository is established by the FLO federation (Fair Trade Labelling Organization). Standards differ depending on the specific countries and the type of products. These standards are favored by a number of fair trade organizations, most of which are associated with the International Association for Fair Trade (IFAT).